Live butterfly releases will make your wedding the most memorable your guests have ever experienced! The release of live butterflies at wedding ceremonies lends a beautiful meaning to the auspicious occasion. It signifies the beginning of a new life as two people come together to share their joys and sorrows with each other. Painted lady butterflies, when released, will fill the air around you and your guests with color. Not only will your guests be in awe, all of them will always have a fond memory of this special moment. The release is elegant and absolutely beautiful, and what a photo opportunity! Releasing butterflies at memorial service is a beautiful gesture to celebrate a life well lived. Painted lady butterflies represent transformation in nature. Releasing them symbolizes the transcendence that your loved one has gone through. It is a unique way to honor and remember them. recommend Clearwater Butterfly as they have several unique packages which offer great value for money. They specialize in making your butterfly release a success. They guarantee that your beautiful painted lady butterflies will arrive alive and in time for your event, and are dedicated to helping everyone create the most memorable butterfly releases possible. They’ve been breeding and shipping painted ladies for 35 years and have 35 years’ worth of happy clients. Being the largest live butterfly supplier in the USA, they also have the best prices. Exclusive Special Offer for Butterfly Lovers! to get a dozen butterflies FREE today! 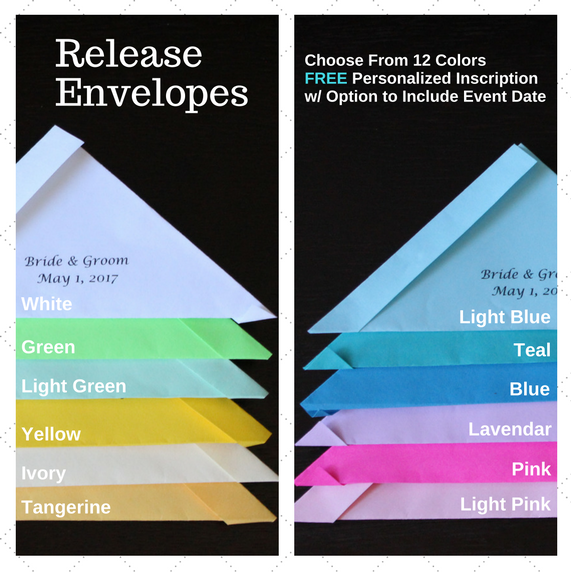 You can get your butterflies packaged in individual envelopes (pictured above), with your choice of envelope color and personalized inscription. For those who’d rather release the butterflies “en masse”, you can get them in release boxes (pictured below) ready to fly. Release box for Painted Lady butterflies by-the-dozen . 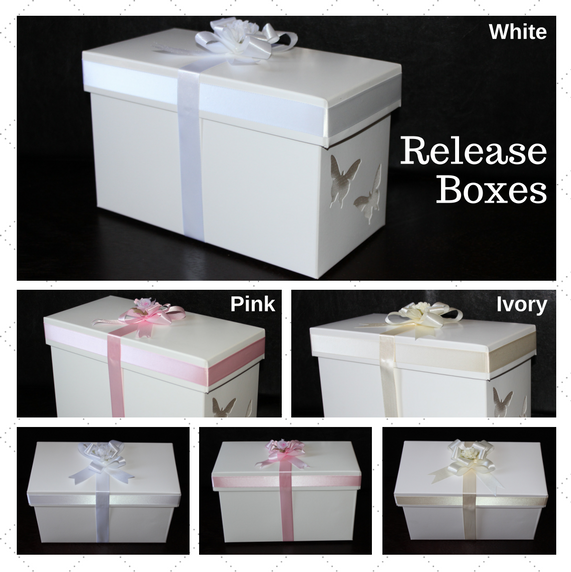 Release box for wedding package. 1) I love this idea! How does a butterfly release work? 2) How will the butterflies be shipped? I’m concerned about their survival. 3)How far in advance should I place my order? 4) Do you ship all over USA? 5) Can I release the butterflies at night? 6) Can I do wedding butterfly releases at night? 7) What happens to the butterfly after the release? 8) What if I need to change my order? 9) Is there a live arrival guarantee? I love this idea! How does a butterfly release work? Individual Butterfly Release: In this, the butterflies are shipped in individual containers. When you’re ready to release butterflies, pass them out to your guests, and everyone can take part in releasing the butterflies! 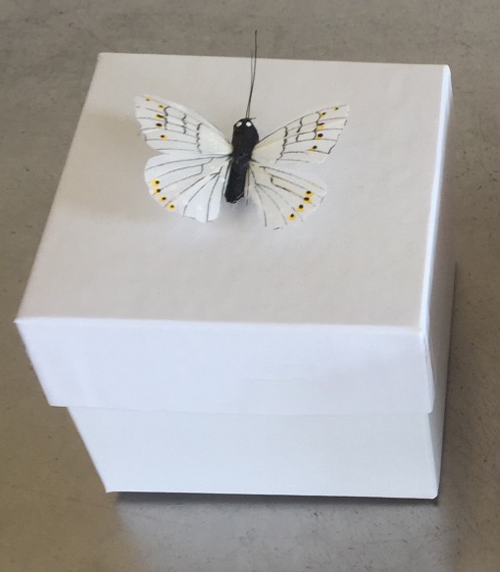 Mass Butterfly Release: In this option, the butterflies arrive packaged together in a decorative mass release container. When you are ready to release the butterflies, simply pull the lid off the top of the mass release container (there are a variety of color combinations to choose from) and they will all fly out. How will the butterflies be shipped? I’m concerned about their survival. For the butterflies to arrive the before your event, Clearwater Butterfly ships them overnight express with FedEx. The butterflies are packaged in a specially designed insulated cooler with freezer packs to keep the butterflies at a cool and comfortable temperature during their transit. Butterflies enter a state of natural hibernation when kept at cool temperatures. Your butterflies will be asleep for the entire journey and stay safe. Placing your order at least 10 days ahead of the event is good to ensure availability (even earlier during summer months). Last minute orders can sometimes be accommodated. We ship painted lady butterflies to every state in the continental USA, including Alaska. Monarch butterflies cannot be shipped West of the Continental Divide because of regulations. Can I release the butterflies at night? Butterfly releases should be done at least two hours before the sunset. If it is a warm evening, the butterflies may still fly during civil twilight, which is up until 20 minutes after the sun sets. If it is too dark, the butterflies will not fly. Will the butterfly release be affected by the temperature? Yes, painted lady butterflies should not be released if the temperature is below 60°F. The warmer the day of butterfly release, the better. What happens to the butterfly after the release? Painted lady butterflies linger around the release area for a few hours. If there are host plants nearby, they’ll stick around for weeks. Clearwater Butterfly will try their best to accommodate the changes. Modifications of shipping address must be made at least 48 hours before the shipping time. Modifications of order must be made by phone and email at least 7 days before the release date. As a rule of thumb, changes should be submitted with as much advanced notice as possible. Is there a live arrival guarantee? The butterflies are guaranteed to arrive alive and in healthy condition. An extra butterfly is included in every order in the unlikely event that any should perish during transport.